Every Friday, the team at Pendulo Studios gathers in "Sala 2," a conference room covered floor-to-ceiling in posters, cut-outs and screenshots from the games it's created over the past 18 years as one of Spain's first independent game studios. For two hours or so, everyone in Sala 2 discusses ideas for new games, ways to fund ongoing development, fixes for current titles and what games they're playing on their own; they call this process "brunchstorming," and it's a vital part of Pendulo's operations. Last Friday, March 16, Pendulo's brunchstorming meeting also served as a celebration: Yesterday, its seventh graphic-adventure title, had just gone gold, and after working on it for a year, the team took that time to celebrate and reminisce about its development with a handful of questions from Joystiq, all in true Spanish style. "Pendulo is not your usual game developer," Josué, Pendulo's writer, said. "Maybe because we're Spanish and we put some fiesta in everything we do, or maybe because we're more than workmates and we've become friends along the years. Or maybe it's because everyone has a say." Around a table piled high with "jamón, chorizo, a Madrid specialty called 'callos,' cheese, chips, empanada gallega (a sort of tuna-and-pepper pie), and something to drink," as Josué described it, the following Pendulo team members sat down to relax and candidly answer our questions about indie living in Spain. Would you define Pendulo as an indie, mainstream or hybrid studio? Alberto: We take turns to clean the bathrooms. That's indie, isn't it? Rafa: We always take pains to get funding. We've never dealt with any of the majors, so I guess we're kind of indie. Ramón: Some people think that we're not because we've been here for 18 years now, but I think we've managed to keep independent and small. Felipe: That's a hidden way of saying: "We're not gonna hire the programming assistant we promised you, Javi." Alberto: They say that the Runaway saga has sold 1 million units. Josué: That can't be true. I bet it's just a marketing tag invented by one of our publishers. Felipe: You really don't want to hear the truth. Where does Pendulo get its funding? Felipe: We've always got it from European publishers, based on the old concept of "minimum guarantee": You advance me some money so I can make the game, then you publish the game and, once you have recouped that money, we share the rest. Josué: There's this guy who gave a speech at Game Connection Paris... what's his name now? He said, "The old business model was based in a developer and a publisher hating each other so much that they never stopped to care about the player." Ramón: Well, we did. Or at least we tried. Felipe: However, that's not a good way to work anymore, for many reasons that have to do with the economic crisis, the changes in the market, the bad figures of most adventure games. We've made Yesterday with one-quarter of the budget that we made Runaway: A Twist of Fate with just two years ago. It's crazy! Since 1994, when Pendulo was founded, how has the game-development industry changed in Spain? Javi: On a binary code, it's changed completely: from 0 to 1. Back then there wasn't, and now there is some. Carlos: Yeah, changed from 0 to 1, too, but on a quatitative scale. That is, from nothing to almost nothing. Javi: There's a small industry, with good professionals, developers, publishers... But, when you see a good Spanish developer and ask where the money comes from, it never comes from Spain. Rafa: The biggest Spanish company right now is Mercury Steam (creators of Castlevania: Lords of Shadow) and that runs on Japanese money. Felipe: And our money is mainly French and German. What is the best aspect of developing in Spain? What is the worst? JuanMi: The best? Spain itself. Nice weather, tasty food, kind people. This is a great country to live in. Josué: The worst is that the country is broke. Completely. Javi: There's this idea that the Spanish people are lazy, you know, all "fiesta" and "siesta," but that's not true. It's not that we're lazy: When Spanish artists go to work abroad -- something that's happening a lot due to our national fucked-up economy -- they are valued as very good and efficient workers. Has digital distribution made it easier to reach a wider audience? Rafa: Unbdoubtedly. Now we can just publish our games on Steam or iTunes and anyone in the world can buy the game. That explains a lot of the indie revolution. Alberto: Yes: Limbo, Super Meat Boy or Minecraft could not have happened without them. Ramón: Could the Double Fine Adventure Kickstarter project have happened without digital distribution? Now a good developer can make its own distribution. Ximo: It means we're not "good developers," doesn't it? Pendulo is known for its graphic adventure titles -- describe your love affair with this type of game. Why is it something Pendulo does, again and again? JuanMi: Because our bosses are cowardly chickens, hey Pendulo McFly? 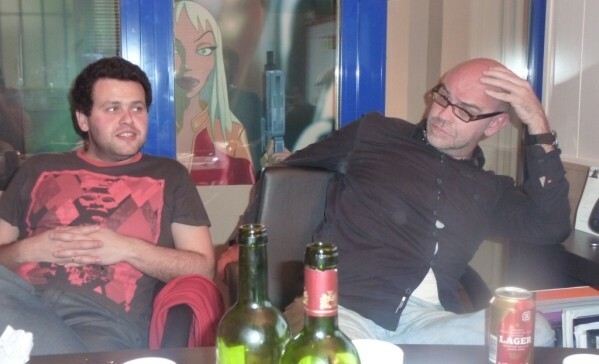 Ramón: Felipe, Rafa and I started Pendulo because we were in love with Sierra's and LucasArts' adventures. We wanted to imitate them and make good adventures, which at the time was like a chimera in Spain. Eventually we made Igor: Objetivo Uikhokakonia, the first adventure ever made in our country. Rafa: The difference is that now we're open to other genres more than ever. During these years we've played a lot, fell in love with other kinds of games and now we're ready to start with something slightly new. Felipe: Hidden Runaway will be our first non-adventure game, and it's shaping out to be great. Not your typical hidden-object game. Alberto: A game in which you must disguise the main character as Freddy Mercury or He-Man. That can't be "typical!" Javi: But it's still a Runaway game... chickens! Carlos: Oh god! I hate Brian Basco! How do you keep subsequent titles fresh when they're in the same genre, in the same style? Alberto: That's the Pendulum Studios Law. Josué: ...and I guess it's true. We've always made comic thrillers, but focusing more in thriller (the first Runaway), then comedy (the second), back to thriller (the third), then comedy (The Next Big Thing) and now thriller again (Yesterday). Carlos: Thing is that we're getting more and more radical. Alberto: That's the Pendulum wave getting stronger. Josué: Four months, closed in this very room without seeing the light of day. Ramón: However. One day we looked at each other and said: Do you feel like developing this plot during the next year? And we said no. We threw the screenplay in the bin and started all over again. Ximo: That's a lie. I don't even wanna imagine what you did in this room during all that time. Ramón: One thing is sure: The second script was much better than the first one. How did Pendulo's gorgeous art style come about? Rafa: We loved the way some cartoons and certain comics look, and we always thought it was much nicer to go that way rather than to realistic 3D renders. Ramón: Remember the pure 2D graphics from Igor and Hollywood Monsters? Felipe: I think they still have some kind of charm. Rafa: While working on the first Runaway, we realized keeping the pure hand-drawn 2D characters would be a nightmare as the process was really slow, so we started making some tests with 3D-modeled characters rendered as 2D characters; we worked to find the perfect type of lines, lights and shadows and the results fit really well in our hand-drawn backgrounds, so we could say we are mastering the art of 2.5D graphics. Ramón: The whole first chapter of Runaway was pure 2D... then we did it again in 2.5... it was crazy! Rafa: We are proud to realize our style is now a trademark of our games, even when it slightly changes from one game to another, but we always are faithful to our goal of achieving the best look for the told story. Of course, the main weight here is that we love those non-realistic looks and they fit very well in our games, even in darker plots like Yesterday. Ximo: Well, if you take a close look, you'll see that the graphic style in Yesterday is quite different than our previous games. Alfonso, David and I worked a lot of time 'til it started to look fine. David: Well, I had never worked it the previous games, so the change was quite easy for me. Even though, I spent ages painting the first background. I was so excited about working at Pendulo! Will Pendulo ever make a non-graphic-adventure title? Will you ever use a different art style? Ramón: Well, as Felipe has said, we're already doing one. It's a hidden-object game co-produced with mobile publishers and developers Bulkypix: Hidden Runaway for iOS, PC and Mac. It'll be released during the second quarter of the year. Have you felt any affects from Double Fine's Kickstarter project, since it catapulted point-and-click adventures to mainstream attention? Josué: I'm a backer myself! I mean, they were the best back then. I'm devouring all their weekly updates. The conversation between Tim and Ron was cool! Rafa: As a developer it's like, "Wow! Who said that adventure is dead?" Javi: Anyone who says: "Adventures live in our dreams, in our memories and in Germany," has the divine right to earn $2 million. Ximo: I think that he should have developed that zombie game he had in mind. Too bad the Cookie Monster talked him out of it. Josué: I'd love to translate their adventure into Spanish. Does anyone have Tim Shafer's phone number? Why did you decide to leave comedy and use a dark story line for Yesterday? Javi: You wouldn't ask that if you lived in Spain. Josué: We've been dreaming for a long time to leave comedy aside. There's this idea, "The Chain Suicides," that Ramón and I have been pondering for at least three years. Ramón: I'd said more than three. In fact, we were trying to make sense of that idea when the idea for Yesterday dawned on us, and we fell for it. For a couple of months we spent two or three hours every day after work, talking in the bar about the plot until it was ripe enough, and then we introduced it to the rest of the team. Everyone liked it. Carlos: I remember that meeting. We were all afraid that the next project would be Runaway 4. I hate Brian Basco! Felipe: The worst that can be said about the Yesterday plot is that it's so full of surprises from the very beginning that you can't really tell people what the game is about without spoiling it. It's a bit like in The Sixth Sense. You believe it or not, but you will be given no proof of it. The other day, the marketing director of FX, our Spanish publishing partner, said, "I love the game, but I know you've made it like this 'cause you hate me!" What is the best part of developing an adventure game? Rafa: The first time that you see a screen with the sprite walking. Josué: Arguing with Ramón is fun. Writing the dialogue is, too. Oh, and the recordings. I love searching for the perfect voice for the characters with the actors and Doug Rand (assistant director of the last three Pendulo games and voice of John Yesterday). Carlos: When Brian Basco dies. 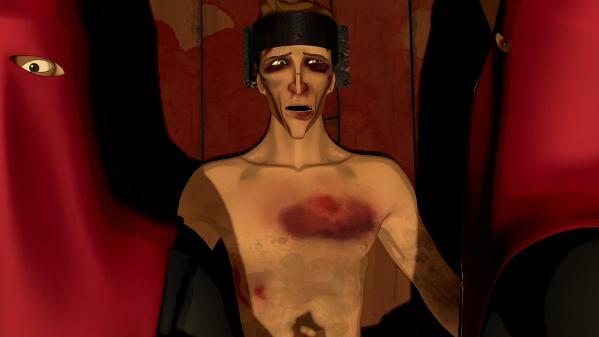 It only happened in Runaway 2 and it was a dream, but as an animator, gosh, I had a ball. Ramón: When the money comes in and you pay all the debts that you've contracted in order to make the game. Felipe: Well, we've never managed to do that. Ramón: Don't spoil my dream! "When the food was finished, we went down to the pub," Josué concluded. "It was cool. We spent the whole afternoon there, but I guess that we deserved it. We even toasted for Joystiq for having given us such a good excuse to party." Tonight we may have to kick back with a cerveza and toast Pendulo for giving us Yesterday, a title we thoroughly enjoyed. No better excuse than a great indie video game, after all. Salud.